That is a very good parallel, but I would say that's the only similarity. Alien is near-future grunge sci-fi, while Traveller is Space Opera; by definition and in function the two genres have almost nothing in common, and Alien is the archetype of its genre (except perhaps for Outland?) so unlikely to present much meat for the comparison. European cinema in general, before it sold its soul to Hollywood, used to cast older actors to play the roles of older people. I remember watching a 1960's French film, the Old Shotgun, or something, about the end of the Nazi occupation of France. SS troopers were mostly middle aged men committing atrocities. The resistance types were scrawny, wore berets and wore glases, looking like intellectuals with submachineguns. What blew me away was that the movie looked like the colorized version of the WW2 black and white photos from the occupied France. As I said, there isn't a lot of genuine connection between the two; the similarity is superficial. Still, I thought it interesting that someone managed to put his finger on why I might have made the connection. We just rented this today. Coincidence! Didn't one of the original Traveller books have the alien from this movie statted out (not mentioning the movie of course)? 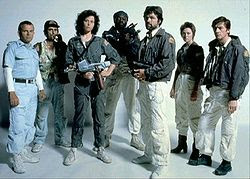 Alien and Aliens are two of my favourite science fiction/fantasy movies. I am not sure I could ever wish the second had never come to be, but I think I understand what you are saying. The marines in the second film are all relatively young, with the exception of the sergeant, and their lieutenant is fresh out of military school. On the other hand, the lack of "experience" is something the film highlights as being a cause of failure, possibly a nice juxtaposition to the original. That is a very good parallel, but I would say that's the only similarity. Gee, I don't know about that. A story about some folks doing some unglamourous work for the lucre and finding far more than they expected or wanted? Sounds like Traveller to me. I never got into Traveler. It was far too abstract. And then the supplements started developing "The Imperium" and it went into the direction that didn't do anything for me at all. For me Sci-Fi was the Great Unknown, the feel of Martian Chronicles the TV series with Blade Runner thrown in. Bradbury meets Halran Ellison in a universe created by Lem. Never went for Space Opera. Escape From NY mesemrized me and Outland blew me away... as did Horror Planet's ending. Alien captures the feeling of Traveller well for me. Sure there is space opera in the Traveller game universe but the game isn't' about the movers and shakers of the struggle between empires, it's about folks making their way in a darned big universe trying to get the funds for the next payment on their starship and maybe earn enough to fuel it up one more time. I remember reading on a forum somewhere that cited a magazine that referenced a convention where Ridley Scott was quoted saying that he was a big fan of Traveller, and that it was a big influence on Alien. This was back in day that Scott used to game on a regular basis with Joss Whedon. I would say that, strip out any references to the Imperium, and Alien has always been one of my bellwethers for Traveller. I've actually never found the basic system to be particularly Space Opera-ish, actually. Yes to Outland, too, and I'd seriously add Solaris to my personal inspiration list. Outland is definitely a Traveller movie, at least by my lights.